Nottingham Forest may have made eleven new signings, but the undoubted star of the season so far is one of those least expected to shine, Adlene Guedioura. The 32-year-old Algerian re-joined the club at the turn of the year, and it’s fair to say that initially he flattered to deceive. Many, including myself, were left wondering if he’d ever replicate the barnstorming form that rightly earned him a move to Premier League Crystal Palace in 2013. Guedioura’s pre-season play was fantastic but I still don’t think anybody expected him to carry it over into the Championship campaign. And he’s done that with aplomb, by absolutely running the show against Bristol City and West Bromwich Albion respectively. When you consider that the likes of Joao Carvalho, Gil Dias, Diogo Goncalves and Jack Colback were brought into the midfield during the summer, it’s even more amazing that Adlene has been the shining light in that department. At Ashton Gate last Saturday, he seemed to galvanise a Forest side that were clearly devoid of any cohesion in the first half. If there was anyone capable of lighting the touch paper, it was him. 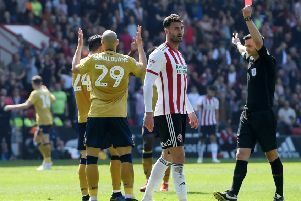 His cross for Daryl Murphy’s equaliser was textbook, and in hindsight could prove to be a telling contribution come season’s end. That performance as it transpires, was nothing in comparison to the absolute masterclass he provided in front of the City Ground faithful against West Bromwich Albion on Tuesday, not to mention the Sky TV cameras. Such was the dominance he asserted upon his opponents, I’d be bold enough to liken it to Roy Keane’s performance for Man United versus Juventus in the 1999 Champions League Semi Final. Or, that of Steven Gerrard’s in the 2005 final against AC Milan. Forest really turned on the style against the Baggies on Tuesday and were unlucky not to have taken all three points. I wouldn’t go as far as saying we were robbed, but on the balance of play I felt we deserved the win. You must take into account that West Brom hit both posts and the crossbar as well as missing from four yards out when Jay Rodriguez blazed over the Trent End goal. For the neutral it must have been an absolute spectacle to witness, especially given the sublime quality of the goals that were registered on the evening. Guedioura’s thirty-yard bullet was the least he deserved for his endeavours on the night, but Matt Philips’s equaliser was almost as good. The former QPR man powering home from the tightest of angles to level things up. And it instantly struck a chord with me because I agreed wholeheartedly with its deployment. Not since the late eighties had I witnessed a Nottingham Forest side thread so many intricate and accurate passes into the opposition’s box. It was a throwback to the Clough, Hodge and Pearce era, where Nigel Clough would almost telepathically play in those teammates, allowing them to shoot at will. Some may argue that Bohinen, Roy and Collymore were indicative of such intricacy but this era owed more to the individuality of Stan the Man when all’s said and done in my opinion. Which brings me to my final observation of the season so far, all 180 minutes of it to be precise. Does any club really need two, out and out holding midfielders? For all intents and purposes, Jack Colback & Ben Watson carry out identical roles, breaking up opposition play and distributing the simple ball to begin attacks. Personally, I think that if you play 4-2-3-1, one of the holders should be capable of a forward pass from time to time, exactly like Adlene Guedioura. Having this type of player effectively gives you a secret fourth attacking midfielder, by being able to link up with the three ahead of him when the opportunity arises. Forest’s 2-0 win away at Wolves last season proved how effective this can be. The Reds actually set up with a 4-1-4-1 formation at Molineux but it’s a similar principle if done correctly. Liam Bridcutt is a good example, people often assume that he’s a natural holding midfielder, when he’s far more effective on the front foot. If you archive footage of the former Leeds man at Forest, you’ll probably find that defensively he’s often five to ten yards off his man. When all’s said and done, the season has barely just begun, but the performances of Adlene Guedioura have raised the midfield bar and given us plenty of food for thought.